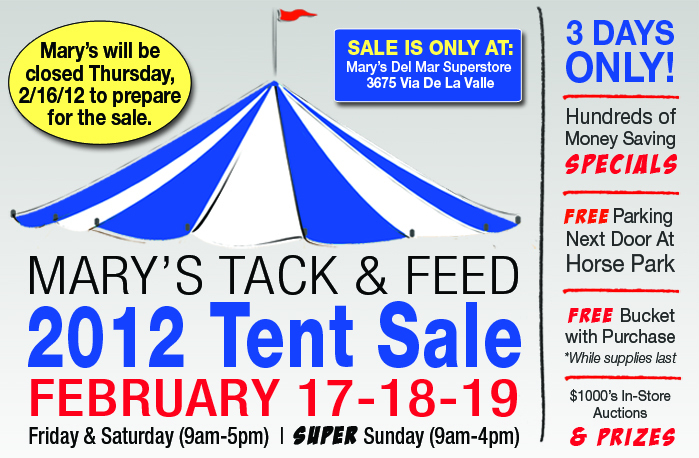 It’s that time of year again, and we’re all getting excited- Mary’s 25th Annual Tent Sale is coming up February 17th, 18th and 19th! “Hectic, frantic, and a heck of a lot of fun,” is the way one of our veteran temporary workers (we call them Temparoonis) described her time of helping at each year’s sale, and we had to agree. In fact, we go from a regular staff of about 40 employees to a smiling crew of over 70 people working the sale! It really has become quite the tradition, with some of our local customers working alongside us for all 3 days, year after year. If you’ve never been to one of our Tent Sales, you might be wondering what the big deal is. Well, in addition to our entire store, we fill an enormous 100 foot tent with TONS of incredible merchandise and amazing specials. The deals are so good this year that we’re going from our normal 4 to 14 cashiers (the most we’ve ever had!). Even our GM gets into the act, with auctions, contests (insider tip: make sure you know who won last year’s Kentucky Derby), and countless chances for you to win a Mary’s gift card. The atmosphere overall is electric, complete with delicious food for our customers and employees, and best of all, the chance for all of us to spend the weekend with all of you! And to top it all off, because the Mary’s Sale is so very special, we’ve had many of our fantastic vendors participate over the years, ready to answer your questions and share their incredible product knowledge with you. So mark your calendars – we can’t wait to see you there! ← Why do we have a Sale Right Before a Sale? I come to your sales every year can not wait!! Mary’s Tent Sales are the greatest!! !